Tada! My first Illo Friday in forever! When my baby cries this hard, it's an emergency, I can tell you. At least that's how he sees it! I bought one of the famous moleskin journals recently. I wanted to make a fresh start and encourage myself to start drawing again. The quality of these journals is supposed to be just the tippy tops, so I finally plunked down the money for one, and I love it. It does ooze a little bit with quality. The warm tan tone of the paper will be something I need to get used to, it make it especially difficult to scan in accurate colors, but I do love it. 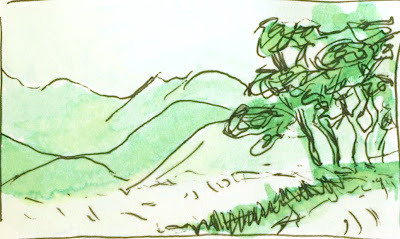 I also decided to branch out just a tad with my usual style and use colored inks for my washes. Single colors, mind you. Not sure if I have it figured out yet, not to the degree that I had the B&W ones down. But it's not bad. Below is my first attempt, and above is my second.